We’ve waxed poetic about our love for our pressure cooker in We Are Never Full’s past posts. It is one of the best pieces of kitchen equipment to have if you want that long-simmering/long braising flavor without the time to to do so. It is not used as often as it should be in the American kitchen. So if you don’t have one, before next winter, please, go buy one! We decided to bust out the PC for a twist on the traditional rogan josh (Madhur Jaffrey’s recipe as a base). This is a recession meal – but only if you have all the spices at hand. If you don’t, you’ll be spending an additional $20 on those! Lamb shanks are some of the cheapest cuts of meat – for two pounds of these beauties we paid about $6. The flavor is intense and, if cooked correctly, the meat falls right off the bone. This recipe could be made in a dutch oven and cooked for about 2 hours or you can just use little old pressure cooker to do the work for you in about 45 minutes. Lip smacking, finger lickin’ goodness. In a blender or food processor add garlic, ginger and some water together to create a paste. Set aside. In the pressure cooker, brown the meat on all sides. Remove from pan and add cardamom, bay, cloves, peppercorns and cinnamon and stir for a few minutes until fragrant. Add onions (and optional hot pepper) and cook for 30 seconds to get a bit of color on them. Add garlic/ginger paste and stir – cook for 20 seconds or so. Add coriander, cumin and paprika – stir a bit. Add a ladle of stock to the pressure cooker and scrape up the browned bits on the bottom. Now add the browned shanks back to the pressure cooker, nestling them in as much as possible. Add stock to come up about halfway up the shanks. They do not need to be covered with liquid but there should be about 2 cups in there. Cover pressure cooker and cook for 40 minutes (0r if you cook in dutch oven, give it about 1 1/2 to 2 hours in a 400 degree oven). Open the pressure cooker when appropriate and remove the shanks – allow to sit on another plate. Check the liquid level in the pot. If it looks a bit too thin, with too much liquid and not enough body, allow it to simmer/boil down so it thickens. When it is thick enough, kill the heat and add the yogurt. Stir. Add some salt to taste. Serve with some basmati rice and enjoy! Lip smackin’ finger lickin’ goodness indeed. The presentation is great too. Love the rice cones. Looks great! 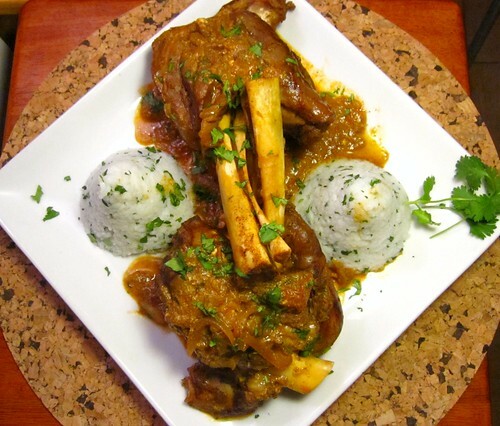 I love lamb shanks, and I love Rogan Josh so I really like the idea of the two combined. Wow, my husband who is a huge huge fan of Rogan Josh would absolutely love this! I can’t wait to try it – sounds really excellent! OMG, I love this. I can almost smell it all the way here. Delicious. What a beauty!!!! I’m immediately calling Obelix… this is his kind of meat! ;D.
I’m not a fan of pressure cookers. I must admit they scare me a bit but the result is superb Amy!!! These rice cones look lovely too :D.
I am not a rogan josh kind of gal, but D is a totally Rogan Josh kind of guy, so I’m sure this is in my future. Thanks for the wonderful recipe! They look delicious and I’m in awe of your rice timbale. I love lamb shanks but generally have them with a more Latin or Med-seasoning/technique. Try adding dried prunes to the pot next time. They add a hint of sweetness and a natural thickening of the sauce. I would love to shake that shank right on to my plate – it is lip smacking goodness – plus I am imagining the marrow! Rogan Josh is finger licking good . I have done the Madhur Jaffrey’s Version. It is such a flavorful recipe. & being an Indian I could not do with out a pressure cooker, its like salt in my kitchen:-D Yours look gorgeous. Three cheers…one for pressure cookers, two for lamb and lamb shanks and three for spice combo. You make me want to watch The Party all over again (Birdy num-nums). Rogan josh, not to be confused with British actor Josh Rogan. Go, go gadget pressure cooker. Wow. That is a festivus for all of us. Ahh, this is our kind of meal–we are obsessed with braises. But I haven’t caved and bought a PC yet; it’s totally a ridiculous-snobbery thing, thinking my oven is better, or maybe it’s just that I love pulling out my fancy green dutch oven. Whatever it is, I do need to get my hands on a pressure cooker. Madhur’s Rogan Josh is definitely a thing of beauty. And, as usual, you’ve done it justice. Madhur Jaffrey is definitely the Queen of Indian cookery, and her rogan josh is a stand out recipe. It’s my ‘go to’ recipe for one of my ‘go to’ curries and I’ve lost count of the number of times I’ve cooked it. I normally use mutton for my rogan josh, on the bone if possible, because it has a much deeper and earthier taste, and the bones add a collosal amount of flavour to the sauce. That’s before I saw this, that is (smacks forehead in a why-didn’t-I-think-of-that? fashion) – lamb shanks!. Of course! It’s obvious! How can it fail! Great idea. Really, very good indeed. Lamb shanks are my favorite winter dish for company. I never think to buy them in the warm weather months, thanks for reminding me…..and hey, how about Josh’s brother Seth Rogan? You forgot to mention him! (no pron this time?). so i know you’re going to be horrified when i say this but… that second shot looks like your shanks are doin it. and i really wanta expound on that but i am just going to SHUT UP NOW. I love the cones of rice!! Very nice presentation, and my word- I suddenly want spicy lamb at nine in the morning, thanks to this! we definitely went a little Madonna circa 1989 with our rice cones (timbale sounds so much more refined – thanks Joan! ), which (Stacey) doesn’t quite qualify as “pr0n”, but, when our lamb shanks are “doin it” (Claudia) it’s all maybe just a bit more suggestive than this simple plate of food might look at first glance. But i’ll take “pron” over hair-loss medication connotations (lo), and any free associating thoughts leading towards Hollywood and either of the Rogan brothers (Heather/Stacey), could lead directly back to Zack and Miri Make a “P0rn0″… thank you all for your comments, as usual. Beautiful dish, I love your plating. I love love love lamb shanks. I almost always order them in restaurants. I’d say lamb rogan josh is in my regular rotation of things I order at my favorite Indian restaurant. Thanks so much for providing a recipe!!! I’m too late; the Madonna bra joke has been used. I’m not even coming up with a Jean-Paul Gaultier pun. Sorry. I should just go to bed. Wow! I love Madhur Jeffrey and your version is gorgeous. I must try this! I got my PC last year and I have not used it enough. This is a dish I have to make. 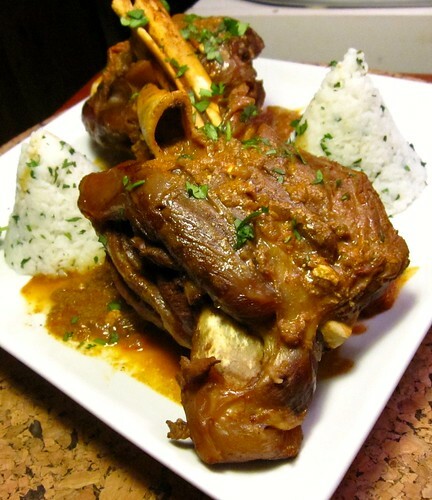 I haven’t had lamb shanks in ages…but this recipe gives me good reason to get all the fixin’s. They really look great. you know pressure cooking is my thannng! getting ready to tape a segment tomorrow on the uses of it! love love the shanks! I am lucky I have you to educate me in the ways of the cooking world. I had no flipping idea what Rogan Josh was – I had to look it up in Wikipedia for chrissakes! But you can those spices so cheap in the Indain stores. Delicious meal. If I see lamb shank on a menu I am a goner. Grts me every time! I think pressure cookers have kind of a retro image in this country along with crock pots and fondue pots (which happen to be two other kitchen staples I love). I just broke out my PC for some Filipino beef marrow soup last night. Your lamb looks amazing, but where did you get 2lbs for $6? I’ve stopped buying lamb shanks because they’ve gotten almost as expensive as veal shanks. weird. maybe manhattan is on to the trend of tough cuts being just as tasty as more expensive cuts? brooklyn must be behind the game. our local market (steve’s c-town – one of the only cheap-ish supermarkets left in the area) had them for about $2.99/lb – i think it was a manager’s special, but still. 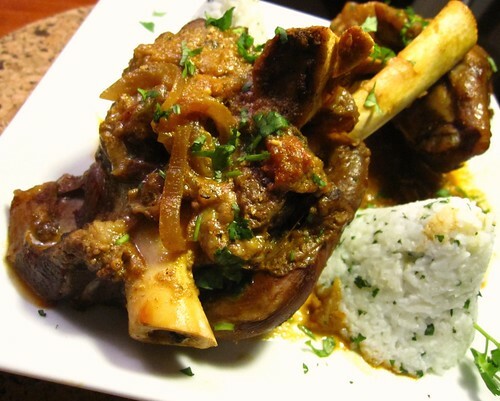 Tried the shanks last night – taste great with good spices. I added a handful of fresh mint (cos I had it) at the end. Us Aussies love lamb and as a curry,stew whatever I prefer shanks for the flavour from the marrow. I bought an upmarket German PC last year and have never looked back, so safe and easy to use. Ha I wish I could buy lamb shanks for $3.00 lb – here it’s more like $6.00 – I never thought Americans ate much lamb – proved me wrong. @Cherry: thanks for trying the recipe and the comment. Lamb marrow might well be one of the world’s greatest things. As kids we always used to fight over the marrow bone in the Sunday joint. And, the price of lamb shanks is probably a reflection of the general lack of appetite for lamb over here. I’ve never understood it, but it’s a fact that Americans as a whole tend to like the prime cuts of meat from blander animals whether by accident or design. Almost all super market meat in the US is corn fed so doesn’t have much flavor, unlike the pastured meat of your native land. In fact, perhaps strangely, a good deal of the lamb, especially the legs, on sale in the States is Australian, the flavor of which could be too strong for the American palate to take. @sweetsavoriessilks: so glad you like our recipe! It’s not always easy to get (or afford) lamb shanks to cook like this, but it’s a nice recipe if you don’t plan 48 hrs ahead! @Rob: thanks for the kind feedback. Delighted the recipe worked out for you. The onions can be tricky in the pressure cooker but I’m glad they were easy to crush. They give the sauce a pleasant sweetness. I’ve cooked this recipe so many times I don’t even refer to it! Tonight, in preparation for tomorrow, I’ve prepared it with beef Osso Bucco! See how it go’s! !